Chemical Peels are one of the most sought after professional skin services today because they can quickly treat ageing skin, reduce hyper-pigmentation and acne, brighten and improve skin radiance. But they also tend to be too aggressive for most skin types, resulting in significant downtime for healing and recovery. 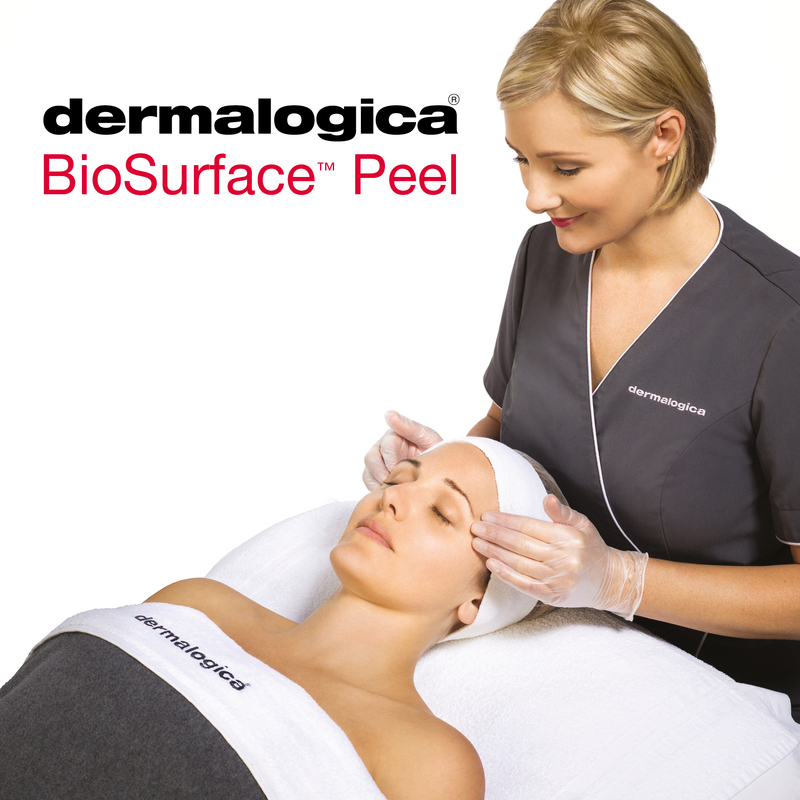 With new BioSurface Peel from Dermalogica, downtime is a thing of the past. Formulated with the most progressive technology available, BioSurface Peel is a biologically active, biphasic peel that will decrease surface roughness, treat acne, reduce fine lines and fade pigmentation. Finally a peel that is less toxic, less costly and more focused on working with the skin, not against it. All chemical peels work by removing the outer layers of the skin. The depth of the peeling is determined by the chemical agent used and the concentration, among other factors. This can range from very light peeling of the upper dermal layers to deeper peeling of the epidermis. BioSurface Peel works via a layering technique. The strength and depth is controlled by a trained professional skin therapist and is based on the number of layers applied and the duration of time that it is left on the skin during treatment. Following a chemical peel, the deeper layers of the skin will respond by regenerating new skin and by increasing the production of collagen. The result is a look that’s smoother and more youthful. Does the skin need priming? It is recommended to prepare the skin with key Dermalogica products for 2 or more weeks prior to treatments. Prior usage will reduce the likelihood of an adverse reaction or irritation to the skin and will yield the best results. Your professional skin care therapist will advise you on this prior to your treatment. A thorough consultation including a patch test is carried out at least 24 hours beforehand. This will determine whether or not the peel is suitable for the individual. Skin is prepped with a thorough deep cleanse to ensure effective penetration of the chemical peel. You will be given a ‘post-peel skincare‘ kit to use following your treatment. Key ingredients used in the BioSurface Peel include: Salicylic Acid, Lactic Acid and Sugar Cane, plus powerful enzymes derived from Pumpkin and Lactobacillus Ferment Filtrate, Papaya and Moth Bean. For best results with BioSurface Peel, it is recommended to perform a series of 3-6 treatments depending on concern. Multiple series may be performed to achieve desired results. It is advisable to have BioSurface treatments in the spring, autumn and winter as this will minimise exposure to sun and decrease the risk of photosensitivity. Allergy to any of the ingredients in BioSurface Peel. Any other prior cosmetic or resurfacing skin procedure such as laser, light therapy, chemical peel or microdermabrasion within the last 2 weeks. Has received Botox or injectable procedures within the last 5 days. Has waxed the area within the last 72 hours. Is taking or has taken Isotretinoin (also know as Accutane) within the last 6 months. Has received a professional exfoliation treatment (scrub, enzyme or Hydroxy Acid) or used any exfoliating or vitamin A-derived product within the last 48 hours. Has been exposed to direct sun within the last 48 hours or has sunburned skin. Has highly sensitized or irritated skin. Any contagious skin infection such as an active cold sore. Has open cuts, wounds or abrasions. If the skin isn’t peeling post-peel, does this mean that the treatment did not work? Absolutely not! Depending on the skin’s resistance and frequency of treatments, you may not experience peeling and flaking. However the skin’s texture should feel a lot smoother and it is important to use only the specially prescribed products in the post-care kit that your therapist will give you. For further information on the BioSurface Peel, please do not hesitate to ask Melissa. This entry was posted on December 12, 2016 by Bijou79.